A brief chat at a Faculty Senate meeting put two University of Delaware researchers onto an idea that could be of great value to cancer researchers. The collaboration of Prof. Prasad Dhurjati, a chemical engineer who has done extensive computer modeling of biological and engineering systems, and Prof. Deni Galileo, a neurobiologist whose expertise is in cell motion and behavior in the brain, has produced a new and freely available computer program that predicts cancer cell motion and spread with high accuracy. An article on their model was recently published in BMC Systems Biology. Galileo has been studying the movement and spread of glioblastoma tumors—an aggressive and devastating form of brain cancer that has claimed thousands of lives, including those of Delaware Attorney General Beau Biden, U.S. Sen. Ted Kennedy and two Phillies greats—pitcher Tug McGraw and catcher Darren Daulton, to name just a few. U.S. Sen. John McCain was diagnosed with this kind of cancer in 2017. A significant challenge for physicians and their patients is that this cancer spreads rapidly, reducing the effectiveness of surgery, chemotherapy and radiation. "You need at least 50,000 cells in one spot to pick it up in an MRI, so surgeons can't see where small numbers of cells have invaded the brain beyond the main tumor," Galileo said. "If you could stop the cells from moving beyond that initial tumor, the surgeon could go in a second time and take the second tumor out. As it is now, they can keep spreading in every direction and it's a pretty hard problem to solve." Galileo and his research team have been studying what triggers the rapid spread of these cells—aiming to disrupt their aggressive advance—and have demonstrated the significant role of a cell membrane protein called L1CAM (L1 cell adhesion molecule). Ordinarily, this molecule contributes to development of the nervous system, Galileo said. 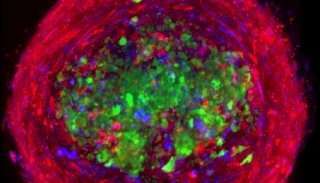 But it acts differently in glioblastoma and other cancer cells, accelerating their growth and spread. Dhurjati and Galileo met at a meeting of the Faculty Senate, which both have served as president. Dhurjati looked at Galileo's work and realized it was a strong candidate for the kind of mathematical modeling he does with biological systems. He has worked with specialists in osteoporosis and the human gut microbiome—that stew of microbes that live in the bellies of humans and animals—and has helped researchers simulate biological behavior to see predicted responses to various stimuli. Galileo wasn't an easy sell, all involved agree. Biologists, in general, don't have an easy relationship with mathematics, he said, and mathematics is central to computer models. But Dhurjati persuaded him to give it a go and undergraduate chemical engineering major Justin Caccavale worked with Galileo to add the biological rules to the mathematical model. "Biological details put me to sleep," Dhurjati said with a grin. "Mathematical equations put some biologists to sleep. But we all have something to contribute.... I've been a missionary to bring modeling into the world where people don't use models." Together, with the help of undergraduate and graduate-level students, they constructed a computer model of Glioblastoma cells that accurately reflects what Galileo sees live cells doing under a microscope. And that opens new opportunities for researchers. "When your model represents real systems, you can play with the model in ways you cannot play with a human brain," Dhurjati said. The simulation gives researchers new ways to ask many different questions: What if we disrupted this growth or motility signal? What if we added a chemotherapy drug here? How would those changes play out? "Is there a way through this molecule—L1CAM—to reduce the rate of spreading and the rate of growth?" Dhurjati said. Possibly, Galileo said. When that molecule is restrained, the speed and proliferation of these cells is reduced by up to 50 percent, he said. More research is needed to understand this better. "But he has convinced me that modeling has good value in understanding how cells make decisions to be highly motile or proliferative," Galileo said. "This really does simulate why they move the way they do in a dish. They follow a simple set of rules. "Biologists need to use more math and more modeling than what they do." Galileo said. "If the only models that come out are scary because of all the equations, they're never going to do that. If it's not too hard to modify for their purposes, there's a much greater chance they are going to adopt modeling as Prasad convinced me to do." This model can be adapted to help researchers looking at other kinds of cells and is ideal for education purposes as biologists look for tools to enhance and strengthen their research capabilities. "A university is different than a cancer research lab," Dhurjati said. "It's a place to train students, to solve problems, to have the love of learning—and there's no better way to like a subject than to actually do experiments. We're here not only to solve big problems but to motivate students to solve problems on their own." Galileo's research focuses on cell behavior in the brain. For his research on glioblastoma tumors, he uses brain cancer stem cells removed from patients during surgery through the Helen Graham Cancer Center and Research Institute at Christiana Care. The cells are injected into chicken embryos, where they grow from tumors, spread and reveal their genetic mechanisms. In normal brain cells, the protein he has studied in this research—L1CAM—is produced and used in healthy ways, promoting growth and development. But in these cancer cells, some of the L1CAM is exaggerated and cut off from the cell membrane. Fragments of L1 then attach to the same cell or to nearby cells, triggering new signals among those cells and resulting in much more aggressive multiplication and spread of the cancer cells. Some cells move away from the main tumor—including glioblastoma stem cells, which produce new tumors as the spread accelerates. Those stem cells are the primary culprits in this cancer and the tumors they produce are often more aggressive than the original tumor, Galileo said. Galileo and his team track these cells with time-lapse microscope images. They grow a single layer of cells in a dish, then wipe away part of them, leaving an edge. They take images of that edge every five or 10 minutes over a 24-hour period and track the cells along that edge to see where they have migrated. They measure the cells' velocity and pathways and manipulate the L1 protein to see how increases and decreases affect the cells. They have shown that restraint of the L1 protein reduces both the speed and the rate of cell division. Galileo is working now to learn more about the interaction of glioblastoma stem cells and L1, create experimental tumors and determine how various modifications change cell behavior. 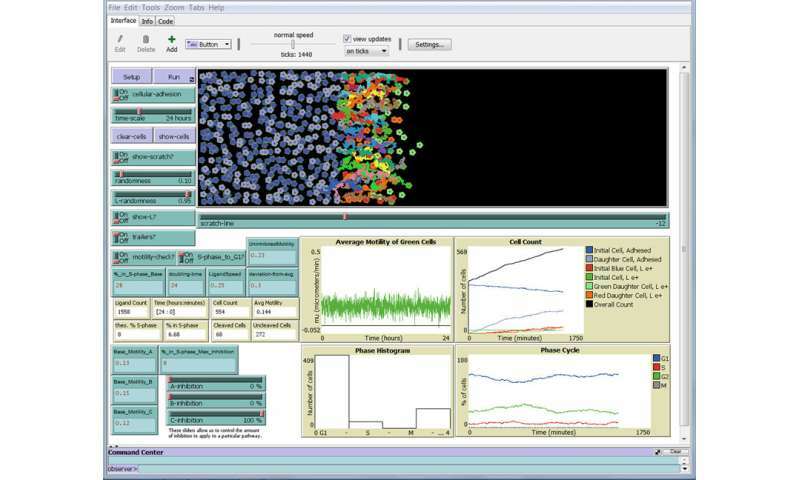 The computer model uses freely available software called NetLogo, which in this case takes biological rules and integrates them with glioblastoma cell data gathered in Galileo's lab. The program looks at each cell as a separate agent and accounts for random or stochastic behaviors that biological systems often exhibit. It does not account for every conceivable biological possibility, however, and is—at this two-dimensional stage—a fairly simple representation. There are plans to advance to a three-dimensional model using NetLogo 3-D.
"We are not interested in stopping cells in a dish, but in a brain," Galileo said. "The next step is to go into a somewhat three-dimensional brain slice model and ultimately we want to model the total three-dimensional behavior of how cells move around. But we have to start simply and that's how we'll progress this model." As the research advances, the models will improve accordingly. "The model is determined by assumptions," Dhurjati said. "We're trying to simplify it so we can still work with it." Assumptions have significant impact on the results shown by any given model. "Tens of thousands of models predicted Hillary Clinton would win the election in 2016," Dhurjati said. "Each model had a different assumption. But who the agitated, unhappy, motivated-to-vote people were was not part of the modeling assumption of the models that failed." This model lends itself to changes in assumptions, percentages, rates and other values. Researchers can make adjustments to immediately see what impact those and other changes have on cell behavior. Justin Caccavale, a senior from Long Island, New York, got involved after listening to a guest lecture Dhurjati delivered to a pharmacokinetics class he was taking at UD. Pharmacokinetics is the study of how drugs and other substances move through the body and what happens to them along the way. "He was full of this energy and so passionate about this work he was doing," Caccavale said. "I wanted to help." He met with Dhurjati for the first time during winter session in early 2017—not for academic credit or money but "for the betterment of mankind, for the advancement of knowledge. I did it because I thought it was cool." "And at that meeting, Dr. Dhurjati said, 'We've got 10 minutes and I'm going to teach you everything you need to know about modeling,' " Caccavale said with a smile. "I used the notes I took that day—on little pieces of paper—throughout the project and I still use them today." Building on a mathematical model produced by UD alumnus David "Jake" Fiumara, Caccavale started meeting with Galileo to understand and add the biological rules and data the model would need. It took a long time to get things right. "There was problem after problem," Caccavale said. "And every time I'd meet with him about a problem two more would come up. 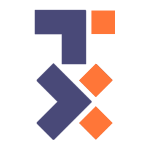 How do you address all that in code? I'm not a biologist, so I had a lot of questions.... We were dedicated to making sure the biology makes sense and we wanted to make sure every single calculation had a purpose." As model development continued, multiple revisions were needed. If the simulation wasn't making biological sense, Caccavale said he would rip the math apart and rework the code so that it was true to the science. His old Asus laptop bore the brunt of this labor and eventually the screen separated from the frame. It still worked, so he soldiered on. "A lot of times a single line of code was missing," he said. "But once a rule was missing and I had to go back to the beginning of the cell cycle. I think I've addressed every single concern now." There are other models out there, Caccavale said, but this one is "agent-based," he said, "which means it simulates outcomes by simulating each individual agent—each cell on its own." The model can run a 24-hour cycle of cell life in about five minutes, Caccavale said, and with a super computer more possibilities could be factored in. Caccavale said he was inspired by the work and the passion both professors invested in their work—and amused by their back-and-forth bickering and teasing. "They are both very gifted," he said. "And I don't even know how to explain their relationship."